...in the Constantia kitchen. All the yellow citrus (left and rear) are from the tree in the garden and have very, very pale green flesh, no seeds, and are tremendously juicy. My mom says they are limes, not lemons. 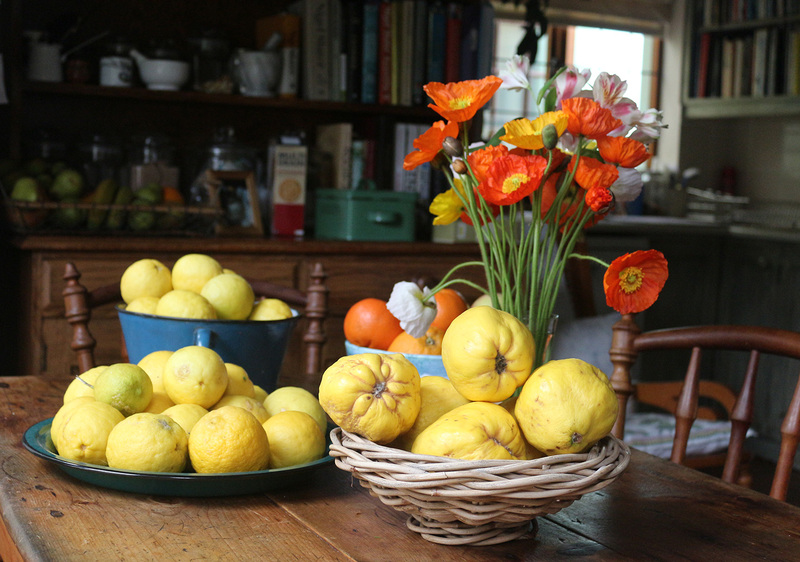 The quinces smell like quinces (in other words, wonderful) and are being used in a lamb stew that I will take to my cousin's house for a thing she calls a Slump - friends get together at the end of the week for a casual supper and are allowed to go home early, if they are tired. It sounds a bit like my middle of the week botanical drinks for plant-minded people. I cook the quinces first for many hours so that they turn a ruby red - you must leave the skins and pips in the water, a trick I learned from my Turkish friend Bevan. Not like New York winters at all, is it? I love that you bring such light and color and warmth from the outside to your kitchen table. Nesting and making a place your own is incredible because you get to come home to it everyday, knowing that you made this cozy home.